Sample shown using White stock with Navy Stafford envelope lining. $210.00 $280.00 As Low As $2.10 ea. 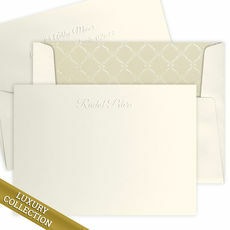 Luxury Embossed Molly Foldover Note Card Collection includes 100 embossed foldover note cards with 100 embossed and lined envelopes. Personalization will be printed in typestyle shown on sample. You select stock color and lining design. 140 lb. 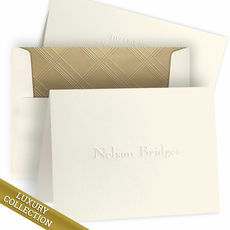 Cover Stock Heavyweight folded note cards measure 5" x 4". The luxury set arrives in a beautifully packaged presentation box. 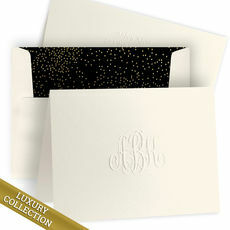 The Stationery Studio Luxury Collection of Fine Stationery features flawless craftsmanship, attention to details and impeccable style, which elegantly comes together in our quintessential collection of luxury Thank You cards.